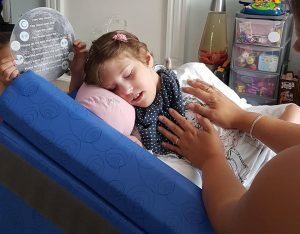 “I am just so glad that I discovered the world of Story Massage,” says Sophie Munnery, whose daughter has Quadriplegic Cerebral Palsy, “Story Massage can bring so many benefits for children with PMLD and their families. 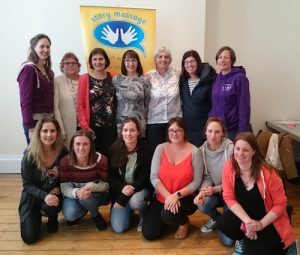 It has opened up a whole new world to us, and to her.” Sophie attended a Story Massage training day and has recently been presented with our Best Practice Award for showing the versatility and fun of Story Massage in her family home. 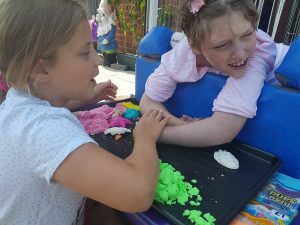 We asked her for some tips and advice to share with others caring for children with PMLD at home or in school. When and where do you share Story Massage with Maisy? The most enjoyable part of Story Massage is that it can be done anywhere and at any time. 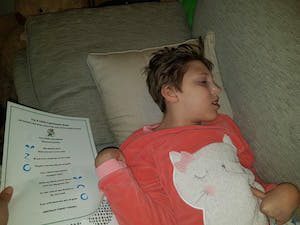 Maisy has Quadriplegic Cerebral Palsy, severe epilepsy and she is also registered blind and has scoliosis of the spine. It is wonderful to have an activity that she enjoys so much – and can fit in so well with daily life. She loves to have Story Massage at any time of day – from waking in the morning to going to bed at night. There is no set time! 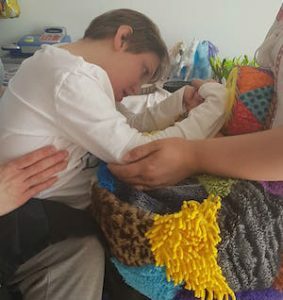 I think it is important to experiment with different positions especially if working with children/adults with PMLD and those who have different sensory issues. Maisy’s preferred position is side- lying. This gives an opportunity to use the massage moves on all part of the body from head to toe. Here is a video of Maisy enjoying Cinderella as a massage story. What have been the key benefits for Maisy? There are so many benefits for young people and children with PMLD. For Maisy, it has been especially helpful in these ways. Strengthening bonds and connection. Maisy has so many complex issues that we sometimes feel so helpless to support her through the good times and the bad times. Story Massage offers a positive way of explaining actions, thoughts and feelings in a way that I had never even considered doing. Helping her to feel calm and relaxed after stressful hospital appointments or physiotherapy. 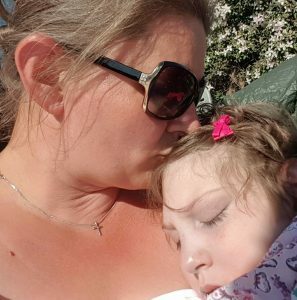 Providing a positive feeling of reassurance and comfort when she is feeling distressed or poorly especially after seizures. Reducing pain and discomfort. We have noticed a real difference in a few months and it so much nicer to give than yet another medication. Enhancing Maisy’s vocal sounds. She is non-verbal but she makes such happy sounds during Story Massage that we know she is enjoying herself! Explaining difficult life events such as the tragic loss of my mother. It was heartbreaking not being able to explain where her Granny had gone. She knew her from the sound of her voice and her gentle touch. We have adapted my mother’s poems as massage stories and this is the perfect way to give a bit of her back to Maisy. Does her sister, Poppy, enjoy Story Massage too? My youngest daughter, Poppy, also loves Story Massage. She has learnt the strokes from me and from the book/video Once upon a touch…story massage for children. 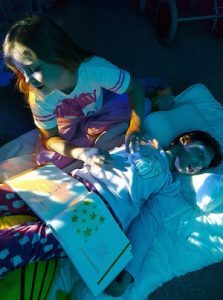 The photo below is taken in Maisy’s sensory room with Poppy reading from the book. 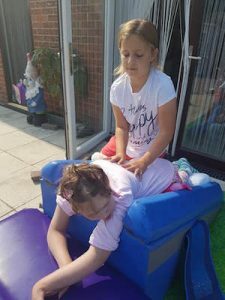 The bond that has always been so special between her and Maisy has become a lot stronger now that she can interact with Story Massage. They have such fun together. Poppy even uses Story Massage in her own play with her dolls and pets. It is such a magical thing to see when a child finds something that makes their imagination go wild! And we all love it when family and friends join in too, even in the rain – like this photo below. What are Maisy’s favourite massage stories? Maisy loves all the stories from the book. And I love to find stories or poems that are relevant to certain activities or situations and adapt them as massage stories. Poppy often gives impromptu Story Massage sessions where she makes up her own stories! Story Massage combines the benefits of positive, respectful touch with the creativity and engagement of storytelling. Ten simple massage strokes form the basis of the Story Massage programme. These strokes have a child friendly name, such as The Circle or The Sprinkle, and an easy to recognise symbol making it accessible for all. 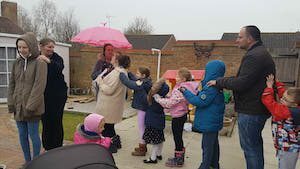 It is a fully inclusive activity, no clothing is removed and no oil is used so it is ideal for young people and children with PMLD in the home or school.